This video, Seeds That Poison, by Beyond Pesticides is only five minutes long and hits almost every aspect of the neonicotinoid controversy. It should be shared widely with others. On a cold winter day this past week I was in my Honey House doing a run of hand dipped beeswax candles. In the background I could hear the radio, tuned to the Public Radio station. Because I was an inside captive I had the good fortune to catch the following program, A Bug’s Death. It is 47 minutes long and full of important information for those of you who want to better understand the environmental crisis we are facing. I was astounded by the report by Emma Pelton of the Xerces Society that they are documenting a 99.5% decline in West Coast Monarch population. When you have a little time, settle in and listen closely to what this program has to say. Click this image to go to WAMU, then click the blue arrow in the upper left to listen. Below you will find links to a very significant paper on the massive decline of insect life. 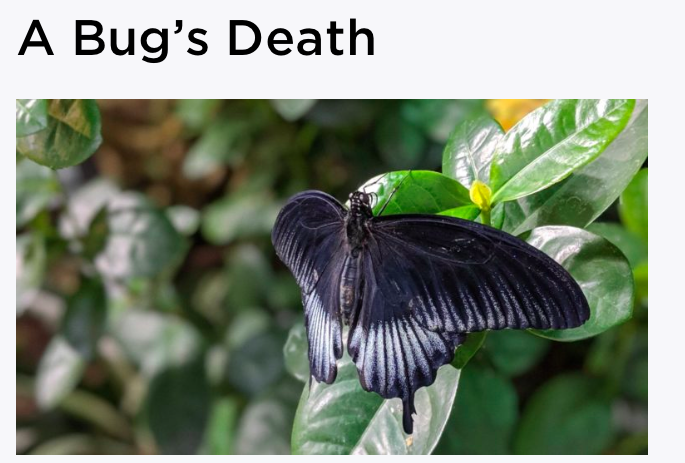 You can read this news report, Massive insect decline could have catastrophic environmental impact, for a condensed explanation of the paper. For those of you wanting more detail, an abstract and access to the full report are here: Worldwide decline of entomofauna: a review of its drivers. The findings and conclusions reaffirm what scientists and close observers have been reporting for more than a decade. Those calls for concern were largely ignored by the chemical companies and the regulators, particularly here in the United States. I have said repeatedly over the past few years that the evidence was showing that we were being subjected to the most massive poisoning of the environment in the history of humanity. This paper confirms those concerns, I believe.